Wacom (TYO:6727), the Japanese exporter of graphics tablets introduced before, is now having the short selling of institutional investors. As of 30 May, Goldman Sachs has a short position corresponding to 4.04% of all the issued stocks, and Deutsche Bank has that of 1.31%, the total of which is 5.35%. Interestingly, after their short selling, Credit Suisse cut its price target from ¥800 to ¥460, with the stock price falling by 4.6% on the day, giving the rational investors a good opportunity to buy more. First we explain the situation. 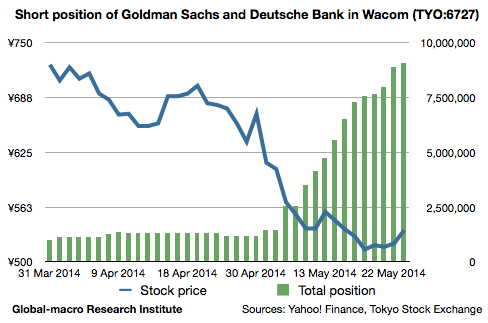 Goldman, the biggest short seller, started its position on 7 May and eventually increased it to 4.04%. Deutsche Bank, on the other hand, started on 31 Mar, much earlier than Goldman. The following is the graph of the stock price and the total of the 2 banks’ short positions. The average selling price of Goldman couldn’t be complimented very much. When institutional investors short sell a growth stock, they need to be careful for the 2 facts: the position size implicitly has a limit as they couldn’t be a whale in the pond, and they couldn’t maintain the position for long as the growth would support the stock price in a long term. Goldman and Deutsche Bank have already sold 5% of the issued stocks, which correspond to 4 times as much as the average daily volume of the recent 30 days. This means they need the volume of 4 days in order to buy back. In fact, during the short selling of Goldman, the stock price fell by about 15%, and it means that when they start to buy back, there would be the buying pressure of the same amount. The limit of the short position could be estimated to be 10% of all the shares, so they still have the option to sell the same amount again. In that case, however, the stock price should be around ¥419, the assumed bottom in the former article. This is the hazardous range for short sellers. There was a reason why we set P/E 10 as the bottom. In general, the short selling of a growth stock is like that of a high-yield bond, in the sense that when you short sell a company that expands its profit by 30% every year, then, the other conditions being equal, you lose 30% automatically. Wacom estimates that its profit per share will be ¥57 in 2016 and ¥84 in 2017. Supposing the stock price remaining the same, the P/E will be 7.3 in 2016 and 4.9 in 2017. This is very unlikely, and therefore the stock price should go up. Although we don’t trust the company’s estimation blindly, Wacom is still a company which keeps its market share of 80% in a industry that can follow the rapid growth of the mobile phone and tablet computer market. It means that shareholders should be rewarded unless the growth of the sales of tablet computers weakens suddenly, or there is something serious that could reduce the company’s market share. Thus, the short sellers couldn’t sell short eternally. The worst situation for them would be when they increased their short position, making the stock price go down to the supposed bottom, and found other institutional investors buying radically at the cheap price. In this case, the short sellers would have not choice but to buy back at a higher price. They would have half a year to keep their position as the holiday season will clarify the future growth of the company. During the period, they can just buy back or sell even more, which would imply a more buyback in the period anyway. In either case, the shareholders have a choice of buying the shares at an appropriate cheap price and waiting for the short sellers buying back. 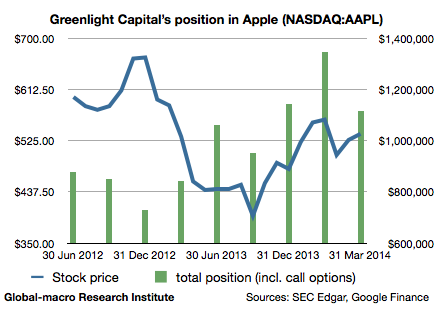 This appendix will conclude the discussion: the graph of Apple (NASDAQ:AAPL)’s stock price and the long position of Greenlight Capital (Mr Einhorn) during the price fall that started in late 2012. The position size was decreased at the highest price and was increased as it started to recover. The current price is $635 as of 29th. Investment isn’t to merely think of the difference of the purchase price and the selling price, but to always adjust the position size according to the situation. This fact is especially important when a good stock is radically dumped.